O. polycratis was first described by Pierre Delforge from the Aegean island of Samos in 2008 and its name refers to Polycrates, son of Aeaces and tyrant (ruler) of Samos from 538BC to 522BC. Delforge, after a lengthy study of the Samos orchid population generally, discovered that the members of the early flowering O. omegaifera group present on the island, had a strictly successive order of flowering and that this species appeared in early April, at a time when O. basilissa, O.sitiaca, O.apollonae and O. omegaifera were all finished. 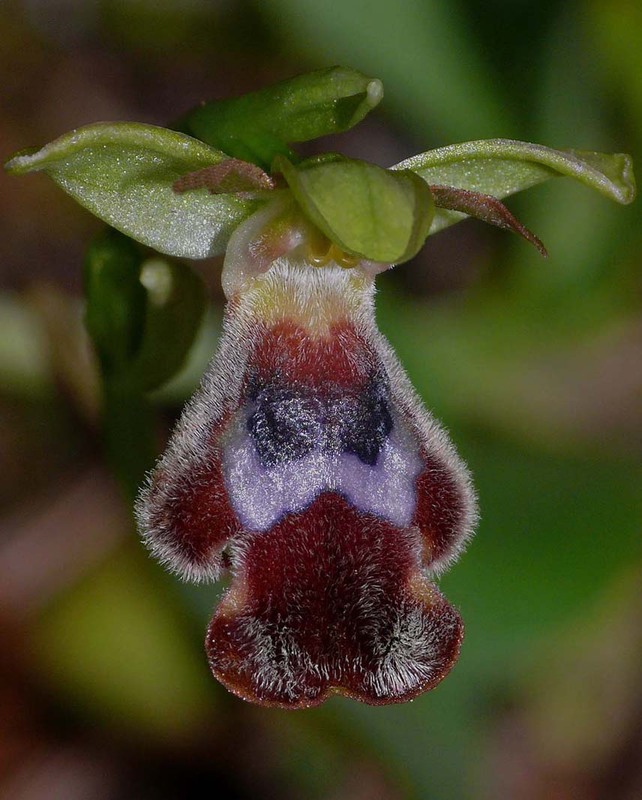 With an average lip length of 18.5cms, the flower of this species is one of the smaller members of its group although significantly larger than that of O. apollonae which can be as small as 11.5cms. As can be seen from the photograph, the lip is densely covered with fine white hair and this is another characteristic which serves to distinguish it from its close relatives. The key differentiator is however flowering period and on Samos, Rhodes or Chios an Omegaifera group Ophrys found in full flower in mid April can only be O. polycratis. This picture is from Rhodes and dates from the 13th of April at which time the species had just starting to flower.